Colorado’s Rocky Mountains were where I learned English. I remember sitting in a confused daze in my grandmother's kitchen as my blonde-haired, blue-eyed cousin spouted gibberish. Even though I spoke English a few years later, I found myself dreading summertime trips to the Centennial State. This city girl from Tokyo was not particularly fond of the Meadow Mountains Girl Scout Camp in the boonies. I also didn't look forward to the stay at my grandparents' Colorado home after camp. Why? The sunny side of Girl Scout Camp: Samoas and Thin Mint Cookies! Click here for the cupcake recipes inspired by the Girl Scouts. Getting up early, preparing breakfast for the family and doing chores were mandatory. Scrubbing dishes was a far cry from the independent living I knew year-round in Tokyo. While scouring stubborn yellow yolk remnants off plates and plunging them into kitchen sink bubble baths, I yearned to hop on a train and glide down the escalator of a Shibuya department store to the food basement. The patisserie cakes and the traditional Japanese sweets sections have always been my favorite. Everything is exquisitely decorated and packaged. Like art. To this day I walk away with a sense of tranquility. There is such gorgeousness and abundance, it's sort of like being Cinderella in a castle pantry. are often served with matcha green tea. There was, however, one Colorado task I relished: Crumbling leftover toast on top of a crudely formed rock fence. Orange-breasted orioles, velvet black larks and blue jays would alight. Squirrels would also dare a visit. They’d dart onto the breadcrumbs-laden ledge and claim their share. So, after decades of declining invitations to family reunions or cutting visits short, I'm writing this post from Colorado. Beautiful Boulder, Colorado where mountains stand like stalwart sentries of wisdom and the secrets of all the things that makes life worth living. Bird songs instead of drills plunging into LA cement are my wakeup call. Bunnies and squirrels skitter across freshly mown lawns….In other words, I’ve come full circle in my love of Colorado. And it’s more than the scenery. It seems that my grandmother’s loving presence is here. Images of her embrace bubble up in my memory. Her kindness (and Mentholatum!) when I was sick...Despite complaints of childhood chores and challenges, her love for me endures. Do you have a full circle moment? I'd love to hear. Boulder is a mecca for lovers of gluten-free and vegan goodies. 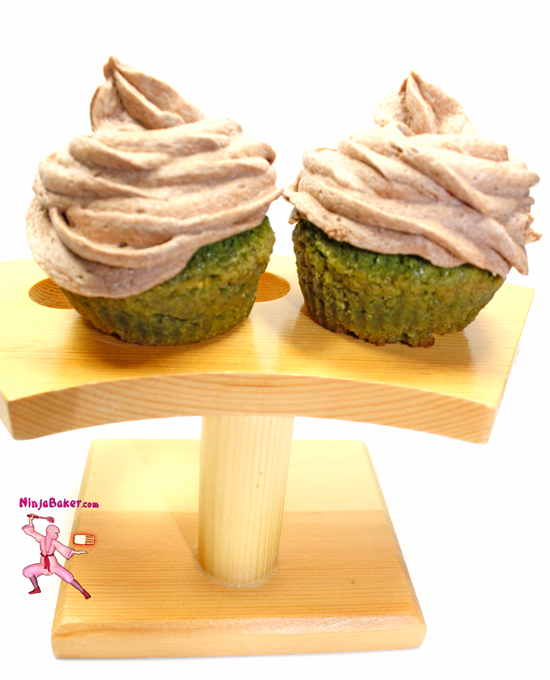 Vegan Green Tea Cupcakes and Vegan Chocolate Frosting recipe. The matcha green tea flavor boldly steps forward in this dense, moist and wonderful cake. Luxuriously laden with chocolate (all dairy free, gluten free and vegan), no one will ever know this is not a “regular” whipped-creamy sort of chocolate frosting. Ninja Note: Cut the quantity of green tea powder if you prefer a subtler tea taste. P.s. I'm delighted to share my recipes with you. If you do publish this recipe on your site, your kindness of a link back to Kim Watkinson, the Ninja Baker is appreciated. In a bowl, whisk together the flours, matcha green tea and baking powder. Starting and end with the flour mixture, alternate adding the dry ingredients with the melted green tea ice cream to the sugar / coconut oil blend. Mix well. Pour in the vanilla extract. Divide the batter into a muffin tin lined with cupcake cases. Cool and frost with vegan chocolate frosting. 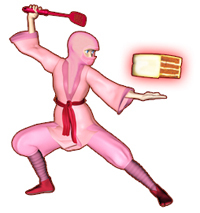 Ninja Note: The cake batter will be thick. Fluff up the non-hydrogenated dairy free butter flavored vegetable shortening in an electric mixer. Slowly add ½ of the powdered sugar. Spoon in ½ of the dairy free chocolate coconut “yogurt.” Add the remaining powdered sugar. Empty the yogurt. Beat in the chocolate cocoas. Pipe onto the cooled cupcakes. P.s. 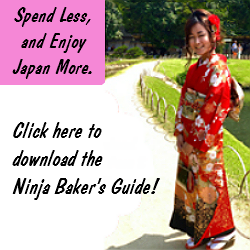 If you are a lover of Japanese green tea and cake, here are a few more recipes you might like. Wishing you the bounty of full circle moments. Follow Ninja Baker @NinjaBaking's board NinjaBaking.com Sweets on Pinterest.